Having played professionally with Liverpool FC ladies team in England, Carine has also excelled in other aspects of her career. A graduate of Stanford University with a BA in Human Biology focusing on human health & performance, Carine also holds an MBA from the UCLA Anderson School of Management. Carine played on the Stanford University women’s soccer team freshman year as a walk-on and has played on a WPSL (Women's Premier Soccer League) teams SF Nighthawks and a brief spell with the Bay Area Breeze. An outstanding player herself, Carine also plays with and against the older players at PSV who are playing High School with some college bound, providing an excellent example both as a player and through her high level demonstrations. As a youth player, Carine was selected to the Northern California State team pool and was a Region IV (western regional US) camp attendee. She was a 4-year varsity player and co-captain at Gunn High School in the San Francisco Bay Area. 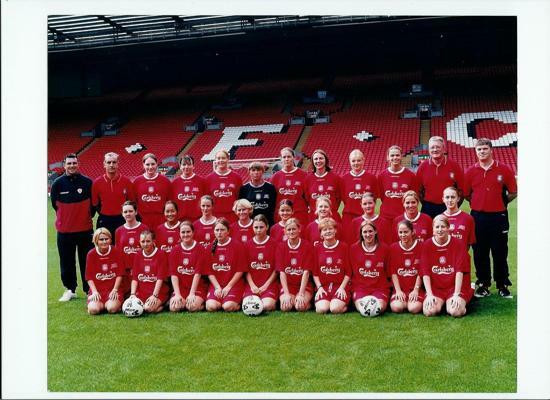 After graduating from Stanford University, Carine played for Liverpool FC Ladies team in England in 2002 as one of the few foreign players in England league. She played in the WPSL from '04-'05 for the SF Nighthawks and Union FC, competing in the National Women's Cup Final in Las Vegas in 2005. Carine played in the top local women's league in the San Francisco Bay Area- SVSA, winning the Silicon Valley 1st Division league in 2011. She also played on the Bay Area Breeze, a professional team playing in the semi-pro WPSL league. While studying at Stanford, Carine devoted substantial time to coaching youth soccer players working with World Soccer Inc. as an apprentice coach, an administrative assistant and camp counselor. During this time Carine trained many State and Regional level players who have since gone onto playing at the highest collegiate levels and internationally in World Cup and Olympic events. She helped prepare Mexican National Team player Veronica Perez train for the 2011 Women's World Cup while Veronica was assisting as a coach at PSV and is currently preparing players to play at some of the top Universities in the country as well as USA National Youth teams. Under Carine's tutelage numerous players have found success at the collegiate and international level. Carine co-founded PSV Union Football Club in December 2003 and became Operations Manager where she was responsible for the managing the master club schedule, coaching schedules, team administration, registration and club equipment. She is considered to be one of the finest women's professional coaches in the country, enjoying much success developing players into State, Regional and National teams as well as college. She currently also helps guide and place players in colleges. In 2006 Carine was a coach/instructor at the Julie Foudy Sports Leadership Academy at St. Mary's College. Carine has managed every team at PSV Union over the last 10 years. During this time she has arranged accommodation, tournament applications, player applications/passes, meals, travel for over 120 tournaments. Carine also has arranged over 3,500 matches both home and away for the entire club and scheduled over 14,000 practices for coaches, players and families as well as managed facility coordination for the entire club. Carine also coordinates the Small Group Trainings, Camps and additional holiday trainings. She has a wealth of experience managing soccer related events around the world. Manager & Head Coach for 35 players and staff to Prague, Vienna and Budapest vs.Blsany, Slavia Prague, Admira Wacker & MTK Budapest youth teams. Manager & Head Coach England for 3 youth teams; vs. Liverpool, Chelsea, Blackburn. sightseeing & training & visit to Liverpool FC Academy. Manager of Union FC WPSL team 2005. Finalist Las Vegas ‘Silver Mug’ National women's tournament. Pine Photonics Communications, Inc., Marketing Associate. Fiber Optics telecom start-up. Peninsula Open Space Trust (POST). Development Assistant. * USC, USF, St Mary’s, Chicago head coaches. "Our daughter Dana has been playing soccer from a very early age. 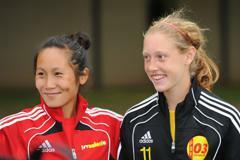 Throughout her soccer career she has played for several teams and has trained with a variety of coaches. A few years ago Dana became more involved with soccer and we wanted to ensure she trained in the very best environment. We evaluated a few options and selected PSV Union, managed by Carine and Gary Ireland. Looking back, we could not have hoped for anyone better than Carine to be such an important part of Dana’s life. Carine contributes to and influences Dana far beyond soccer. Carine coaches with great passion, dedication, discipline and inspiration and was able to motivate Dana like no other coach and to instill her passion for soccer. Carine is a role model and inspires Dana to work hard and to do the very best she can not only on the soccer field but with everything else she does as well. Carine taught Dana various aspects of soccer and played a significant role in bringing Dana to the next level of play and to open her college opportunities. Carine has high expectations and is an amazing coach for players that would like to take the challenge and are willing to work hard to improve. We are grateful for everything Carine has given Dana and we have no doubt any player, no matter his or her level will greatly benefit from the valuable qualities that Carine possesses as a coach and mentor." Yolanda and Gadi Schwartz, February 2012. "Carine possesses all the qualities in a top class coach. She is incredibly knowledgeable, wants her players to develop into great players, and manages in a very professional manner. Carine cares about her players and if you show her that you are willing to put the work in, there is nothing she will not do to help you progress and meet your goals. When I was training for the world cup she would train with me on the field every morning and then we would do it again in the afternoon with the club. You don't tend to find a coach who is able to demonstrate what they are teaching (correctly and at game speed) and work harder than you at practice. But I would say that best asset about her as a coach is how passionate she is about the game and how great she is as a player. She is one of the greatest players I have ever had the privilege to play with". Veronica Perez. Mexico Womens World Cup player and former University of Washington All Star."